Spotify wants more fans. After offering a free, shuffle-based version of its music streaming service on iOS and Android, it’s now tempting college students in the US with 50 percent off a new Premium subscription. Spotted by Recode, the offer is valid for up to 12 months and to qualify, students will need to give their name, where they’re currently enrolled, date of birth and any other documents requested by verification service SheerID. It brings the total cost down from $9.99 to $4.99 per month. In 2012, Spotify teamed up with the National Union of Students (NUS) in the UK to offer an identical deal. The discount is still in place, although scholars need a valid NUS extra card or UNiDAYS account to qualify. 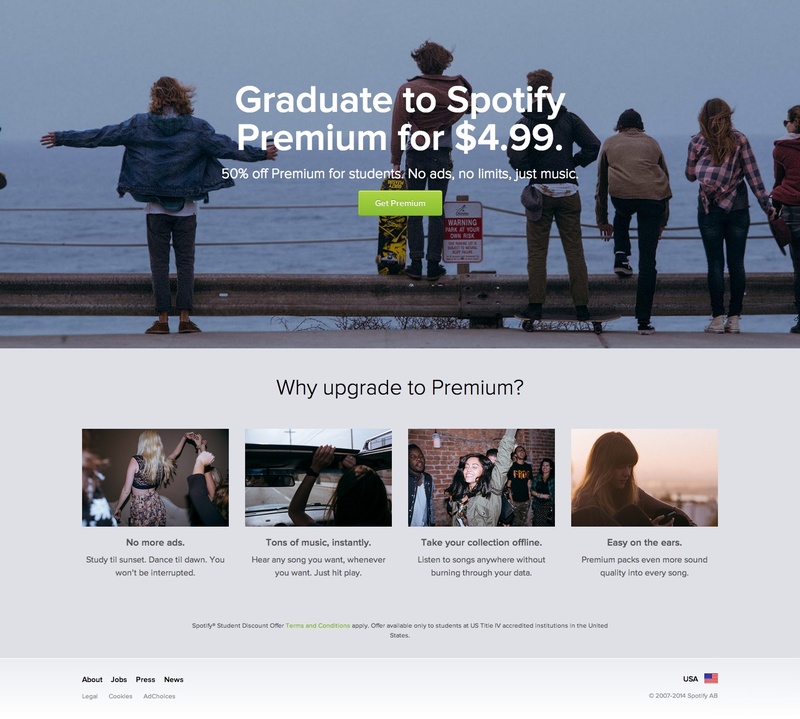 It’s unclear what impact the half-price Spotify Premium subscriptions had in the UK, both in terms of sign-ups and the percentage of people who continue to pay or use the service after the initial 12 months. Regardless, Spotify no doubt sees the larger student population in the US as a crucial demographic for its future growth. The company is increasing the value of its service at an alarming rate in the face of growing competition from Deezer, Rdio and Google Play Music All Access, as well as newcomer Beats Music. Bringing new users onboard is sensible strategy, but it’ll be interesting to see how many listeners Spotify can convert into dedicated subscribers. Students are always looking for a good deal and if a better one is offered elsewhere, there’s a good chance they’ll swap allegiances without a second thought.